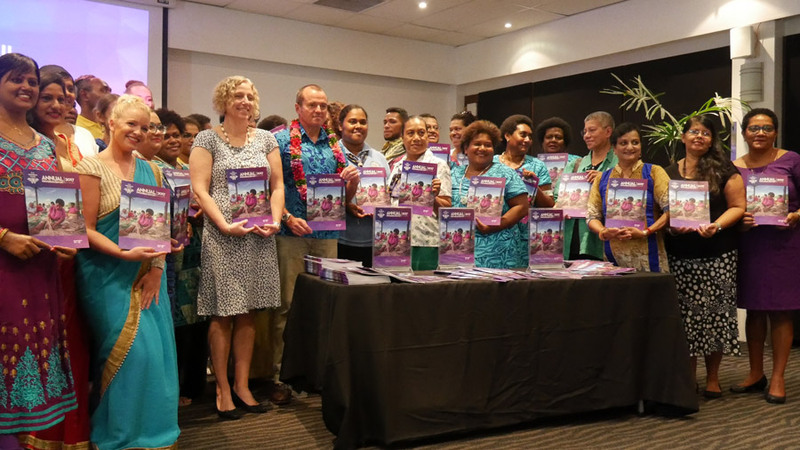 The Fiji Women’s Fund (the Fund) today launched its first annual report showcasing its achievements since its inception in 2017. November 2017 concluded the Fund’s inception phase with much to celebrate. The Fund’s Steering Committee, comprised of nine women of diverse backgrounds representing Fiji’s women’s movement, civil society, private sector, Fiji government and the Australian Government met for the first time in February 2017 and convened a total of four meetings over 2017. The frequency of meetings reflect the busy year for the Fund primarily focused on its establishment. This also included design of the Fund’s logo, undertaking the first call for proposals and development of grant and financial management documents including its grants manual and finance and operations manual. In launching the report, and in recognition of International Women’s Day 2018, Australian High Commissioner to Fiji, John Feakes highlighted the Australian Government’s ongoing support for gender equality and women’s empowerment in Fiji and the Pacific. ‘Australia’s investment in the Fiji Women’s Fund reflects our commitment to work alongside Pacific governments, civil society and women’s movements to progress the status of women and girls in the Pacific, including in Fiji. Gender equality and the empowerment of women is a key pillar of Australia’s foreign policy and we continue to invest in this area significantly’, said John Feakes. John Feakes congratulated the 14 partners to receive support from the Fund, worth FJD 1.9 million. The partners are femLink Pacific, House of Sarah, Rise Beyond the Reef, Medical Services Pacific, Partners in Community Development, Ra Naari Parishad, Women in Fisheries Network Fiji, Talanoa Treks, Fiji Girl Guides Association, Naitasiri Women in Dairy, Aging with Empowerment and Dignity, Survival Advocacy Network Fiji, Women’s Wing of the Fiji Trade Union Congress and Delailasakau Women’s Group. He said he looked forward to tracking the progress of their work in the coming years. The Fiji Women’s Fund is an initiative of the Australian Government’s Pacific Women Shaping Pacific Development (Pacific Women) Program. It commits up to FJD 16 million from July 2017 to June 2022 to support women’s groups, organisations and networks in Fiji expand and enhance efforts on strengthening women’s empowerment and gender equality. The Fund provides funding, capacity and network development support.